It’s late August and Cochise County Sheriff Joanna Brady has never been busier. Her daughter, Jenny, is heading off to college, her rambunctious five-year-old son is about to start kindergarten, and a new baby is on the way. Joanna is also coping with the emotional aftermath of sudden and unexpected deaths in the family. To keep her job as the top law officer in this beautiful town in the Arizona desert, she’s also got to mount a successful campaign for the upcoming election—a battle that won’t be easy, thanks to a tenacious local newspaper reporter who enjoys stirring up trouble. The sheriff’s life is about to get even more complicated when a puzzling new case hits her department. The bodies of two women have been found at the base of a nearby peak—two vastly different women with seemingly no connections to link them. As Joanna and her team methodically hunt down answers, they begin to uncover a knotty web of sordid secrets and evil lies—clues that take the valiant sheriff down a winding and dangerous road that leads shockingly close to home . . . and close to a desperate and determined killer. Sheriff Joanna Brady has a lot on her plate—she is up for re-election as sheriff, pregnant with her third child, and her eldest is packing up to leave for college. Then Joanna is woken in the middle of the night by a call reporting a motor vehicle accident. Her mother and stepfather’s RV ran off the road at high speed and hit the pillar of an overpass. 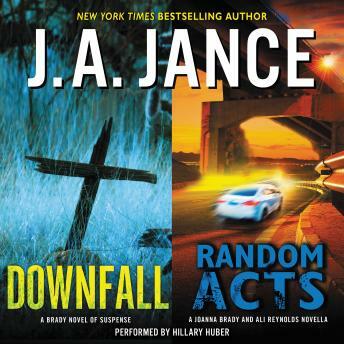 Something about the accident seems suspicious, though, and when Joanna gets a call from Ali Reynolds, a journalist turned investigator, she accepts her offer to help. They come up with a plan to find out who was responsible . . . even if that person is not the villain they’d expected.